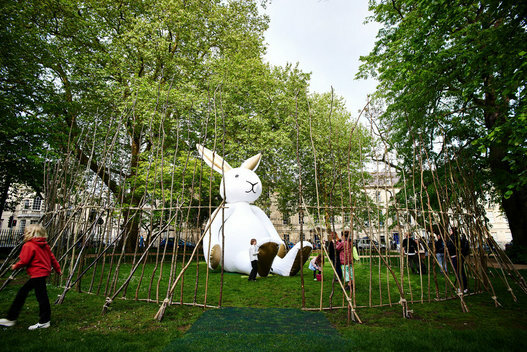 Bath’s historic Queen Square became the home for a magical “Forest of Imagination” this weekend, put together by a team of local creative organisations in a free 4-day contemporary arts event for the City. Designed by Grant Associates, Forest of Imagination welcomed over 6,000 visitors who enjoyed chances to meet Dreamer, a 7.5 metre giant rabbit, play in a bamboo installation, make a forest book, assemble a giant monster from recycled materials, become Lost Explorers to discover the flora and fauna of the Forest with the House of Fairy tales and enjoy a series of talks on play and imagination. On Monday 18 May 2015, over 200 school children from seven local schools took part in a series of workshops to support creativity across their curriculum. Bath-based creative partners behind the Forest of Imagination included children’s charity 5x5x5=creativity, landscape architects Grant Associates, Feilden Clegg Bradley Studios, design studio Imaginnovation, Herman Miller Cares, Bath Spa University, Bath Illuminate, Carpenter Oak, and The House of Fairy Tales. Artists and designers involved in the event included Edwina Bridgeman, Jono Burgess, Jessica Palmer, Alison Harper, John East, Helen Lawrence, Matthew Leece and staff and students from Bath Spa University.